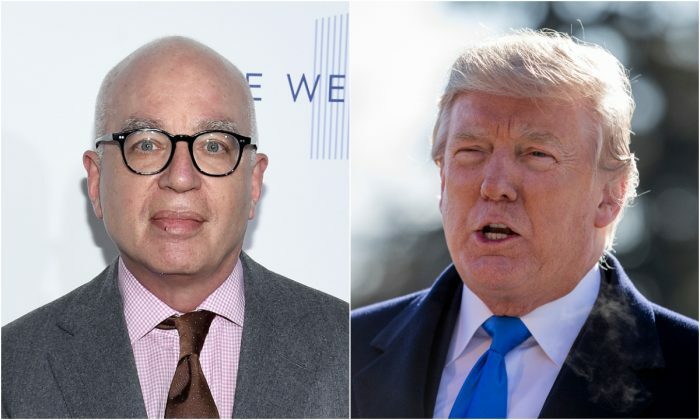 Michael Wolff, a columnist for USA Today, The Hollywood Reporter, and GQ magazine, published a book on Friday, Jan. 5, about Donald Trump’s presidency. Based on reviews, excerpts, and one lengthy adaptation, the book attempts to portray Trump as intellectually retarded. In doing so, the book’s portrayal is closely aligned with the anti-Trump strategy adopted by the Democratic Party shortly after his inauguration. However, Wolff isn’t known for accurate or ethical journalism. Wolff’s columns gained popularity in the late 1990s for harsh criticism of New York media moguls. Rather than in-depth investigations, Wolff focused on embarrassing personal details and speculations, as described in the extensive 2004 profile by the New Republic of him. In what the profile called a “psychoanalytic schtick,” Wolff makes the reader believe he’s pierced the inner psyche of his subjects. But he’s been repeatedly accused of distorting the truth. After he released his second book, “Burn Rate” in 1998, 13 people familiar with the subject, including seven of the book’s main characters, said, “Wolff invented or changed quotes,” Brill’s Content reported. With his political persuasions described as liberal “in a striving, aspirational, Clintonian new-Dem way,” Wolff’s new book, “Fire and Fury: Inside the Trump White House,” seems to follow the same pattern. “In some places, he recreates entire scenes, complete with dialogue, without explicitly identifying his sources,” The New Yorker noted in a review of the book. One of the key characters in his narrative, former White House aide Katie Walsh, already denied the negative comments about Trump that Wolff attributed to her. Trump’s friend Tom Barrack did the same. One source that Wolff relied heavily upon, Trump’s former White House chief strategist Steve Bannon, has so far denied only part of the claims attributed to him in the book. Trump’s lawyers have since sent Bannon a cease-and-desist letter accusing him of breaching a non-disclosure agreement, ABC News reported. Axios reported Wolff has recorded conversations with Bannon, providing a list of typed notes purported to be a partial index list for the recordings. Axios stated, without further proof, that Wolff has recordings of other sources too, some of whom thought they were talking off the record. That wouldn’t be a new tactic for Wolff either. “He has a reputation for busting embargoes and burning sources by putting off-the-record comments on the record,” the New Republic profile said. Trump issued a statement regarding Bannon on Wednesday. Trump’s attorneys sent additional cease-and-desist letters to Wolff and his publisher, Henry Holt and Company. “I’m not going to go through every single page of the book, but there are numerous examples of falsehoods that take place in the book,” she said during the Thursday White House press briefing. “Frankly, some of you have even tweeted out that the president not only knows him but has played golf with him, tweeted about him,” she said. Wolff responded to Trump’s comments on Friday with yet another character attack.